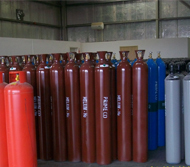 Prime Co. (Middle East) Ltd., is a holder of DET NORSKE VERITAS (DNV) Quality System Certificate ISO 9001:2000 for Trading, Distribution and Stocking of Industrial Gases, Refrigerants & Chemicals, and the associated Equipment, especially for use in Oilfield and telecommunications Industries. This recognition not only puts Prime Co. (Middle East) Ltd., in the league of the finest in the world but also reinforces the fact that Prime Co. (Middle East) Ltd. doesn´t just make promises about quality, but delivers quality. This section contains specifications for our industrial gas line.